An expedition is dispatched to find the mysterious monster roaming the seas. 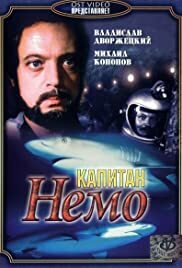 Three crew members learn it to be an advanced submarine crewed by free men and headed by Captain Nemo. Their adventures continue aboard the amazing submarine. Picking up from Sherlock Holmes and Doctor Watson: The Acquaintance (1980) adventures of Sherlock Holmes and Dr. Watson continue as they oppose a fierce crime syndicate in one of their greatest challenges. A spy is sent to Moscow. The task of the KGB is to neutralize him and thus prevent a revolt in a fictional state of Nagonia. Mukhtar comes to live and work at the police kennels through rather unusual circumstances. Together with his handler, Glazychev, Mukhtar helps to solve large and small crimes. Many of respectable citizens become a tramps after the collapse of Soviet Union.